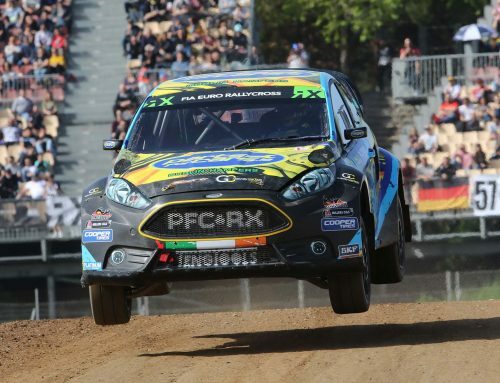 Ireland’s only FIA European Rallycross Champion, Derek Tohill, will fight for supremacy at his home circuit, Mondello Park, this weekend in a super-strong 18-Supercar line-up (July 22 – 23). 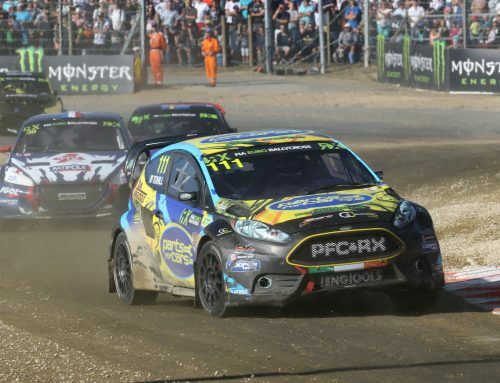 Competitors from the MSA British Rallycross Championship will join Irish regulars in what is set to be the most competitive rallycross event in Ireland for over a decade. Reigning Irish Rallycross Champion Tohill is unbeaten at Mondello Park in 2017, having used IRX events to prepare for his campaign in the European Rallycross Championship, but will have to fight hard together with the PFCRX team this weekend to maintain that run of success. 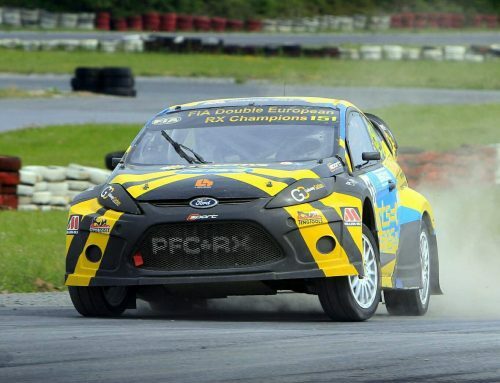 The 2010 and 2013 Euro RX Champion raced a Ford Focus Supercar at Mondello Park in 2015 the last time British RX visited Irish shores and finished second. This time, he wants home victory. Racing the team’s OlsbergsMSE-built 600bhp, four-wheel drive Ford Fiesta Supercar, Tohill has made the semi-finals at every round of the European Championship so far this season, a series that includes some of the leading British RX competitors. 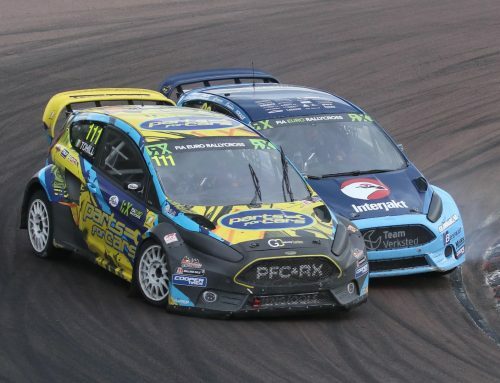 This weekend, the PFCRX team will not only compete to win, but will also run development suspension components on the Fiesta in a bid to increase the car’s pace long-term. For the first time ever, the Mondello Park circuit will be run in different directions over the two days of the event, Tohill having sampled the anti-clockwise layout in IRX rounds over the winter. Come and watch the action and support the team this weekend. Full weekend or single day tickets are available, find out more on the Mondello Park website. “Many years ago it was events like this that motivated me to get involved in rallycross. It’s fantastic that there is such a big entry for the event – there are lots of good quality cars and drivers. It’s a very, very long time since we had 18 Supercars in Ireland, but racing in Europe I’m used to almost 35 top line Supercar competitors at each event, so the more the merrier. There is no real added pressure for me to succeed at Mondello as there is always pressure to win no matter where you’re competing internationally. I finished as runner-up to Ollie O’Donovan a few years ago at Mondello, so I think it’s my turn this time to take the lead. In rallycross, anything is possible, I’ll just go out and enjoy myself. I love driving this car and I love fast circuits, so I’m hopeful that we can be in the mix come the finals. This will be my first time competing in my own Supercar with my own team at a big home event, so I can’t wait for the weekend. I guess it’s only something I would only have ever dreamt of happening while I was racing in the clubman classes for so long, but it’s good to dream. Ultimately you have to work damn hard to make it happen. Our team has grown a lot this season as up until recently it was pretty much lots of friends helping out after work. We have moved things up a gear this season and have (preparation experts) C-Sport involved full-time. It definitely feels like the right decision and I am beginning to enjoy driving and the actual events a lot more this season. The old and new crew are all working very, very well together and it will be fantastic for them all to compete in a big home event this weekend. The importance of this event for Irish Rallycross and motorsport in Ireland cannot be underestimated. Rallycross has seen huge growth at international level in terms of quality, numbers, budgets, professionalism and media coverage. 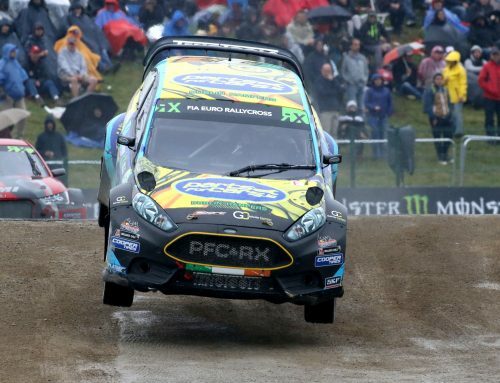 Other domestic Championships have also gone from strength-to-strength but it’s taking a little longer in Ireland due to a degree of uncertainty in Irish Rallycross over the last number of years. We’re not out of the woods yet at domestic level but IRX is definitely getting stronger and the huge work behind the scenes is slowly but surely beginning to pay off. We need this event to motivate the next generation, as drivers like Dermot Carnegie, Laurence Gibson, Helmut Holfeld, John Maloney and many more did for my generation.